Miss Calamity and I were heading to town the other day and our conversation turned to - what else - zombies. We were noticing the fences surrounding homes as we traveled along and deemed most of them woefully inadequate - they wouldn't keep out stray dogs, much less the flesh-eating undead. A vast majority of the fences were of the picket variety, although, being in farm country, there were a number of barbed wire fences, cattle panel fences and even a few pallet fences. The one thing all of the fences had in common was that they were sagging, broken or completely destroyed. Not much of a zombie deterrent when you think about it. 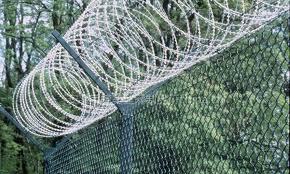 As we were discussing the intricacies of a proper zombie-proof fence, we came upon a stellar example. It was chain link (painted a lovely green), about 8 feet tall and concluded at the most magnificent gate - heavy metal with bars close together and a decorative initial in the center. Being in the middle of a hay field (cover was nowhere in sight), we saw the wisdom of investing in such a fence. The only addition we thought might be prudent was a loosely coiled roll of razor wire affixed to the top of the fence - a deterrent for the really aggressive zombies. Our zombie talk progressed from fences to encompass escape and evade techniques and which caliber varmint rifle would be best for zombie hunting. The more we talked, the more we realized that your zombie tactics would change according to your location. Follow me here. If you are in America, your defenses will have to be redoubled. American zombies are aggressive. They are fast, tough and relatively intelligent (for zombies, that is). They travel in a collective and overpower their victims with shear numbers. American zombies have heightened senses, they lay in wait and have super-human strength. Compare that with, say, English zombies. English zombies (more appropriately called "British Zombies") are slow, relatively passive and easily dissuaded. Overpowering an English zombie is simply a matter pushing them out of the way. One could easily pick them off like ground squirrels with nothing more than a .22 and a defensive position. Not only are English zombies pushovers, England itself is replete with zombie-proof dwellings. Castles (some boasting moats) and fortresses dot the landscape. Even the most aggressive zombies will be hard pressed to succeed where generations of knights failed. 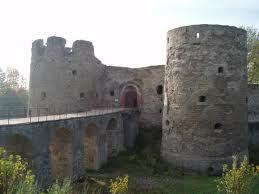 Additional benefits of ancient fortresses are the fact that they were built to defend. The circular staircases were built to allow a right-handed man to retreat while still fighting with his right hand while the aggressor had to advance using his left hand. Very few American homes were built with defense in mind, hence, they are not particularly defensible (or zombie proof). In the end, Miss Calamity and I concluded that in order to survive a zombie apocalypse, one might want to move to England. With its superior castles and inferior zombies, Great Britain may be humankind's last, best hope for survival. 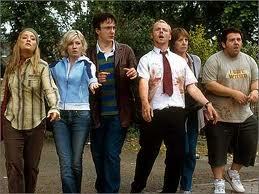 Have your passports ready - England may indeed be the best place to survive the zombie apocalypse. Have you been sipping the Cranberry Rose before tea time? There is no way I'm fleeing to the UK. This is my home. This America. So, Zombies, take heed, I have a huge meat grinder!!! Ireland would be my pick. The place with Great Britain used to be has too many foreign-born persons living there. They have little or no attachment to English as a language or culture. They'll turn on the English when things get bad enough. Think the riots of a few months ago. Except magnitudes worse. Oh that and firearms are illegal so you've got to arm yourself with cricket bats. Scotland might be acceptable except it's on the same island as England. Pro - castles. Cons - no firearms. And as things in the south worsen, people will fan out and head north. History has shown that Ireland preserved a great deal of learning and knowledge during the Dark Ages and brought that back to mainland Europe by way of Irish monks. Love the homeschooling picture. :) Posted. Actually, it was the Elderberry wine! I like your meat grinder idea! I'm glad you caught my tongue-in-cheek mood and didn't take me too seriously. I'm with you - I will stand my ground, whether they be zombies or not. FYI - Everybody, I was kidding!!! You know I was teasing, right? I imagine that we will all stay put. Thanks for visiting. Precisely what I needed after a long day watching protozombies shuffle past my door. Thank you! If you really want to get away to a secure zombie resistant enviroment, move to Texas. We got wide open deserts with nothin to block our aim on Zombies. It gets real hot in Texas. I think most zombies would rot in Texas. In Texas too we have been dealing with Zombies since the 17th century. Zombie invasions in Texas history. Union Invaders during Civil War. General Santa Ana and the Mexican Army. The media talks about increase in Border Violence, etc,etc. We have had border violence here for the past 400 years. I live near padre Island and hundreds of years ago a tribe of cannibalistic indians supposedly lived on Padre Island and ate some Spaniards. Now thats a real Zombie story. For all you home schoolers and amatuer historians out there, google "the Battle of Gonzelez, Texas" during the Texas war of Independence. Check out the "Come and take it" flag too. When I was a teenager there was no fence or wall that could stop me. In fact we would climb up gutter drains to the top of second story buildings. Young, strong, active people will not be stopped by a fence. What a fence does for you, even an inadequate fence, is it delineates when in intruder becomes and intruder. Much like a "No Trespassing" sign can make someone a law breaker a fence makes a trespass intentional and lets YOU know they are up to no good. For this reason even an inadequate fence is adequate. Oh Enola, How could you? I'm English and British (and I suspect that most of those Taffs and Jocks still vaguely think of themselves as British too) but what hurts is the insinuation that we'd all turn into pushovers as zombies. Just because, in the film you show the still from, they weren't quite as 'aggressive' as your 'colonial' type zombies. OK yours need to be shot, repeatedly and then bludgeoned - and then still try and grab you as you transition to your shotgun. Whereas a British zombie only needs a sharp rap on the head with a handy implement (despite the rumours cricket bats are not de rigeur here, my personal preference is for simple length of stick, readily available since as everyone knows we all do morris dancing every second Wednesday. Also vinyl records are quite effective - have you ever been hit on the head by an expertly thrown copy of Pink Floyds 'The Dark Side Of The Moon'? No, well let me tell you it smarts!) and of course they all queue up to take turns (we're good at queues here). So, the simple truth is we have a better class of zombie here. The type that only eats you if you don't disagree too vehemently, can't conjugate your verbs correctly or forget to dress for dinner (are an Oik in other words). Whilst I agree a castle would be 'jolly useful' I shall be quite happy here, sitting on the veranda sipping a G&T watching the zombies fall into the Ha-Ha. (Full disclosure, I don't actually speak like that, well except for when I stand in front of the boss to request yet another second Wednesday off. Oh, and the only Ha-Ha I have is courtesy of British Gas laying a new gas main). Why don't we have ladies like you here in old blighty? Now that makes me sad. I live in California, I have experiene with zombies. They moved here from all parts of the country and from around the world. The best way to deal with them is to remove their support systems. Then they run off screaming and losing body parts as they go. The other day I found a zombie's arm lying in the roadway. I think he lost it when somebody stopped paying him to attend Occupy Oakland. It must have been his picket sign arm. I live not that far from a castle in the British Isles (England, Scotland, Whales, Ireland I decline to say which) but in a Zombie Apocalypse event I will *not* be heading there. Why not? Because too many other people will be heading there. While there is safety in numbers you want to keep the group relatively small and you need to be able to *trust* the other members. I can't do that with strangers and I can't transport enough food and equipment to survive a prolonged event. I need to bug-in or bug-out to a pre-stocked retreat. A brick wall is sufficient to keep out Zombies (not so much unlawful rioters with a sledge hammer) you just need to board up the ground floor windows and doors. I went to what you would call a public school. Many of the kids there were pretty good with melee and range weapons though fortunately they tended to be less-than-lethal! Doesn't anyone watch movies? You can't hide or run from zombies/monsters/assorted nasty creatures. They just keep on shufflin' 'til they get you. Except for the fact that the varmint rifle is illegal without special "license" and if you injure or kill anything other than a squirrel with it, you will be prosecuted to the full extent of the "law". So killing zombies would probably result in your long term incarceration in England. Not a lot of zombies in Texas, except around Austin. What I don't get is exactly what it takes to become a zombie...just watched "The Walking Dead" and with all that blood spattering going on as the heroes slice and dice the head of every zombie they come in contact with....well, you'd think there might be a little contamination, wouldn't you? Just confused! What a fun piece - especially when one expects to read something serious about survival, prepping, or the degradation of society. Perhaps more than anything, your having to continually remind us that it was written "tongue-in-cheek" shows our need to laugh more. God wants his children wise and discerning, but also full of joy and loving kindness. You will be an invaluable resource during the Zombie apocalypse due to the fact that you are so accomplished in identifying and dealing with them! So sorry - I will try to keep my disparaging remarks to a minimum in the future! But, I must ask - what is Morris dancing? I think you may be right - rioters have proven to be far more dangerous and unpredictable than the common, garden variety zombie. Apology most gratefully accepted (tongue in cheek). And no, I don't actually do it, I've two left feet, red-ribbons clash with my eyes, and I'm allergic to being hit with a pigs-bladder. Now aren't you glad you live in a sensible country? You are joking , right? NO guns, No knives, No baseball bats in the UK. captaincrunch- not to go too pc on you but I think technically for the Cherokee Indians, the whites were their zombie invaders, not the other way 'round. Sorry, I have a tribally registered daughter and hubby, and I am sensitive to those sorts of things! Thank you very much for sharing this wonderful article, I really liked it a lot.